Just a day after his solo debut released on Sparrow Records, American Idol alum Colton Dixon chatted it up with Jesusfreakhideout.com's Courtney Warner to discuss A Messenger, American Idol... and Batman. This interview took place on: January 30, 2013. JFH (Cortney Warner): Hey Colton, this is Cortney from Jesusfreakhideout.com. How's California treating you? JFH (Cortney): Nice! Are you out there for Idol stuff? Colton: I'm actually out here because we're rehearsing because I'll be with Jessica Sanchez in the Philippines in a couple weeks, and we were rehearsing for that yesterday. JFH (Cortney): Very cool, sounds like fun! OK, aside from your album releasing, which I believe was just released yesterday, what else are you looking forward to in 2013? Colton: Yeah, [the album] did. Man, I'm so overwhelmed with the response from that. But I'm really excited to tour with Third Day. Love those guys, and I've listened to those guys since I was little. My dad is like at "mega fan" status *laughs* So me and my family are really excited for that. But besides that, I don't even know what's coming at the end of this year; I'm just taking it a couple months at a time, really. So I'd say just between the album and the Third Day tour, that's definitely a lot to look forward to this year. JFH (Cortney): Right on, sounds like it'll be a lot of fun with Third Day and everything else you've got going on. How did that all come about? The Third Day tour. Colton: Actually, management told me that Third Day was interested, and then I had dinner with Mac Powell and his wife back when the American Idol tour came through there. And they're so sweet; Mac officially extended the invitation there, and we talked about it a little bit and I was definitely on board. Even since management mentioned it, I said "yes, definitely take that and run with that." [I'm] really looking forward to that. They're great guys and they'll be great "first mentors" for my first tour--being out on the road, and seeing and knowing the "do's and don'ts"; it's gonna be awesome! JFH (Cortney): Sounds like it's going to be a great tour for sure. Since your album just released yesterday, what's been some of the early feedback/fan's responses to it so far? Colton: From what I've seen, it's all been really great. I don't know if people are just not sharing their negative comments or what *laughs* But it seems like the fans are really enjoying it and I know they've been extremely patient. I've been working on this record since the week I was eliminated, you know, so it's been a good little period of time that I've just really poured a lot of work into it. Yeah, they seem to really love it. I know I love it, I'm really proud of it, and I'm glad they're connecting with these songs, too. That was my biggest priority: that they would really connect with the songs, and that they could use these songs as tools to spread the Gospel, you know? And I'm just super happy about that. JFH (Cortney): When it comes to songwriting, where do you get your inspiration? Colton: It varies. It can come out of a Bible verse, it can come out of a piano lick I've been working on, or there's even a song called "Scars" that was inspired by some of my fans' stories. I asked them to send in their stories and their testimonies, and I was just really broken, reading some of these emails, and the reoccurring word was "scars," which is kind of where the song came from. I just wanted to encourage them, you know? That today's another day, a brand new day, you know? To learn from our mistakes and know that we're forgiven, and that we're not forsaken. It's just a new start, every day's a new start, and I think some of those people who sent emails needed to hear that. And it's so cool to hear people who got through those things to connect with that song especially. So it really varies where song ideas or song inspirations come from. JFH (Cortney): I did the review for your album for our site, and "Scars" was one of my favorite songs off of your album, so good job with that one, it's a good song. JFH (Cortney): So, kind of going along with that, what song has the most meaning to you/sticks out to you the most on your record? Colton: *whistles* Man, people ask me what my favorite song is, and I end up naming five or six *laughs* But I think "Scars" is a huge one for me, I really connect with that song as well. I'd say "Never Gone" is another one that I really connect with, and it's still one of my favorites, just because it was really what I was going through towards the end of my Idol career. I really just felt disconnected from friends and family, and God at one point, and I just remember Him comforting me and saying, "I've been with you the whole time, and I promised that I would never leave you." So kinda like an "O ye of little faith" kind of thing; I'm sure His nickname for me is "Doubting Thomas" *laughs* But yeah, that idea behind that song really encouraged me and I was able to bring it to life with my producers, and that's been one that I really connected with. JFH (Cortney): And that was the one that you performed on the tour, right? JFH (Cortney): So, how do you think this Third Day tour will be different from your Idol tour? Aside from the people, that is. Like production wise and whatnot? Colton: Um, I will not be dancing to "Moves Like Jagger," that's for sure. *laughs* Man, fans have some serious blackmail on me, that's all I'm saying. *laughs* It's really going to be a chance for me to have a set period of time to really just pour my heart into these songs, and to really worship with them. I know I had a brief moment to do that with "Never Gone" on the Idol tour, but I'm excited to actually have a time for worship, you know? Not just one song, or one brief moment, just to really connect with them, and to really just be a "window" to look through to see God. That's what I want to do in this career, to be a reflection of what God's doing. So hopefully that'll happen on the Third Day tour. We know the material, and we're just gonna get up there and play it, and rock out on some songs, but most of the time just get out of the way and let the Word move, and I'm really excited for that. We're gonna have a good time. JFH (Cortney): Cool. So, going along those same lines, if you could create your "dream tour" with you either headlining or supporting, with maybe 4-5 acts, who would it be? And it could be anyone living or dead. Colton: Switchfoot would be one, (Cortney: good choice.) Um, man, I think Coldplay would be another; Lifehouse would be another one. Um, man, hmm... I think Thirty Seconds to Mars would be awesome, too, but I don't think they would fit the other acts. *laughs* Musically, those guys are just insane. Blows my mind. I think Casting Crowns would be another awesome tour to be apart of as well. I've been to a couple of their shows and, I'm truly blown away by how genuine they are, and how Mark Hall is just completely able to get out of the way, and let the Lord move. And He really does move, you know? I remember feeling the Holy Spirit totally filling up that place when I was there. Yeah, I'll stick with those. JFH (Cortney): Your partnership with Sparrow Records, how did that come about? And did you ever consider signing with a major record label like Atlantic or Warner Bros or someone along those lines? Colton: Yeah, I didn't know, since I was on a mainstream television show, as far as music goes, if that was God opening the door to mainstream music or not. So I had some time in there where I was just going back and forth and seeing what God wanted me to do. If I had the choice, I would've gone with Christian music from the get-go, but I just wanted to make sure that that's where He wanted me. So what I decided to do, instead of asking for a straight answer, I just asked that God would be in the middle of these songwriting sessions, you know? And, just depending on that, that God would answer it that way, you know, with songs. And He did; it's pretty obvious that I needed to be in Christian music because some of these songs were pretty specific. But as far as Sparrow Records goes, it was suggested by my management company that we have a meeting with them, and I'd heard great things about Sparrow Records. They have such an amazing roster, but even after just one meeting with them, and really seeing who they are as people, not only as record people, I was sold. So it was just a matter of getting the business side of things taken care of, but I absolutely love everyone at my record label. I even go there just to hang out sometimes. *laughs* They're just great people, so I'm really happy with that. JFH (Cortney): So, while on the Idol tour, I know you got to sing Switchfoot's "Meant to Live," off of The Beautiful Letdown. You said that you wanted to sing that on the show, but you didn't get a chance to. Were there any other songs you wanted to sing on the show but didn't get a chance to? Colton: Yeah, we were actually planning on doing "The Sound of Silence," by Simon and Garfunkel on the show, and it was so cool. It was really stripped down, like, it sounded like something Danny Elfman and Tim Burton would've put together. *laughs* It was really rad. I was gonna do "The Show Must Go On" for Queen Week, would've loved to have done the Switchfoot song, of course, would've loved to have done "I Will Not Bow," by Breaking Benjamin; I love that song. There are quite a few, actually, it just kind of depended on the theme week. That's where "The Sound of Silence" came from. But yeah, there are so many songs I wish I could've done. The "big" one I really wanted to do was "Everything" by Lifehouse, so I'm glad I got the opportunity to do that one. JFH (Cortney): Yeah, that was a great one. I didn't watch the season last year, I felt kinda bad because I've watched every other season but last year's, but I heard about you, and I was able to catch some of the videos online and whatnot, and that was great, by the way. JFH (Cortney): That's what I'm hearing, I was kinda disappointed with the previous seasons, so I was like "Well, I don't really have time to watch it" so I didn't, and it ended up being one of the better seasons! Colton: Ah, OK. But yeah, I understand. JFH (Cortney): So, who are you currently listening to right now, like who's on your iPod? JFH (Cortney): How did you know music was what you wanted to do with your life? And were there any other potential careers you considered when you were younger? JFH (Cortney): A lot of young people look up to you as a "role model" of sorts now. Has that affected how you go about your life, or has it just been "business as usual"? Colton: If anything, it's been more accountability. I mean, I don't do the whole "party scene," I don't drink, I don't smoke, or any of that. But even in just normal decisions, even if it's just like, what movies you watch--especially what movies you tweet/Facebook about. Man, there definitely is a younger audience that looks at every move I make, and that's why I try to make sure I'm setting a good example for them. Just having that accountability and watching what I post has been good for me, in making decisions on what I watch or whatever it may be. Yeah, it's been really cool for me in that aspect, just to lead by example. JFH (Cortney): Very nice. Yeah, you're 21, right? JFH (Cortney): So it's kind of a weird balance now, because you're an adult, but you have a lot of younger fans looking up to you, so I'm sure it's kind of a strange dynamic, with what you're going to talk about and stuff. Colton: Right, yeah, you just have to be. You have to be careful about how you approach "adult" decisions. It's really what it comes down to. You know, because there's a lot of non-adult "eyes" looking at you and at those decisions, and maybe even the right decision, they might just not understand it or whatever. So yeah, especially just watching what you post. *laughs* That's probably the big thing. JFH (Cortney): So, I've heard you're a big Batman fan and I'm assuming you've seen the newer Christopher Nolan Batman films. Which one is your favorite out of the three and why? Colton: Absolutely! I'd have to say The Dark Knight. I think the third one was great, but I wish Catwoman would've been more like she was in the Tim Burton film, but I chose The Dark Knight because Heath Ledger just did a phenomenal job at doing his job, which was portraying the Joker. I know that must have been a feat but it was just so good, you know? I know Batman's not like a horror movie or anything, but there were really moments that freaked you out. It's just that, the Joker was so sick and twisted, and how he went about being that, and I just thought it was a really well thought-out movie, portraying two of my favorite characters which are Batman and Joker so I really, really loved that movie. Still do. JFH (Cortney): Agreed, that's probably my favorite out of the three films as well. It was extremely well done. Going along the same lines, if your life was a movie, who would you want to play 'you' and what would your theme song be? Colton: Hm, that's a great question. I mean, I would love for someone like Brad Pitt to play my character, not gonna lie to you. *laughs* Man, I don't know, I think Johnny Depp would be cool, he looks nothing like me, but I like him as an actor. I really have no idea on how to jump on that one. Theme song... "Jesus Freak" by DC Talk. JFH (Cortney): Good song. Good CD in general, too. Colton: Yes, good CD, amazing band. JFH (Cortney): For sure! Any other favorite film, aside from Batman? Colton: Favorite films. Hm, I can't list one, to be honest with you, I'll list two. "Gladiator" with Russell Crow, and "The Book of Eli," with Denzel Washington. JFH (Cortney): Both are good films, definitely. OK, for the last question, what has God been teaching you lately? Colton: Man, I think it's really, even through the Idol process, just to put all my trust in Him, and to be patient, and to wait, and to listen, you know? Just to really rely fully on Him. He's gonna get the job done, but it's going to be in His time, so we just need to be patient with what He's doing. For me, I would say a prayer, and expect it to happen right then, you know? But He's just been teaching me that it's all according to His time, and His plan, and I'm just thankful I get to be a part of it, you know? In such a big way with the record coming out or whatever, and even just with all of that, with Idol, with the first season I tried out, it didn't end up working out, and I just remember feeling like, "man, I thought this was it," or whatever. And He's basically just saying "not yet" or "be patient, you just need to be patient." And when I least expected it, I tried out for another year, and things went really well, and I knew that was God doing all that because I had absolutely no desire to try out again. *Laughs* But yeah, definitely just relying fully on Him that everything's going to happen according to His plan, and in His timing. Yeah, that's definitely what I've been learning. JFH (Cortney): Very nice, that's awesome. Well, thank you so much for your time tonight, Colton, and I hope you have a great rest of your night. Colton: Thank you, it was nice talking with you as well. 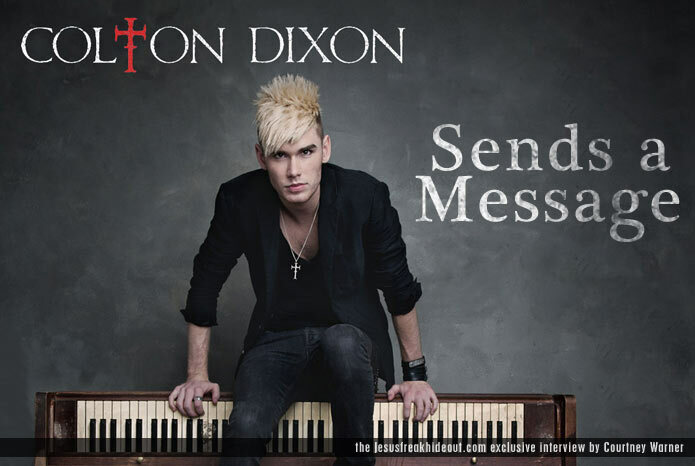 Colton Dixon's debut album, A Messenger is available now wherever music is sold!